I emptied the dip into a bag of tomatoes he was buying when he wasn't looking." "Shoveling Up Poo Into A Bin Would've Been Bad Enough, But We Didn't Even Have A Shovel"
"I work in a bar/pub and a sewer pipe exploded outside the place. The council refused to do anything because it was the weekend, and the whole street was filled, ankle deep, with human poop. The manager made me and another guy spend two hours cleaning it up. Now, shoveling up poo into a bin would've been bad enough, but we didn't have a shovel, or any empty bins. So we had to clean it all up using a kitchen tray as a makeshift shovel and copious amounts of plastic bags. It was not the highlight of my career." "Was a manager at a McDonald's and I got screamed at by our district supervisor, mid shift, for putting two too many ketchup packets in a bag through the drive thru. Forget. That. So I put in my two weeks and waited to pull off my dramatic exit. The end of my two weeks notice landed on a day that the district supervisor came through the drive thru on a weekly visit; he pulled up, ordered his food and I got it ready. But when he came to the window, it wasn't his bag of food I passed out the window to him- I gave him a bag full of nothing but ketchup packets. He came in asking, 'What the heck,' fuming and stomping around all angry. I just said, 'I'm outta here.' And walked out." "I was working at a gas station on Halloween. Pretty normal night, a bit more beer than usual. And then I see some kid walk by with his collar pulled up, he's walking a little odd. Then he walks back the way he came, which is a little weird. Then I notice his friends walking up. I'm looking at them and I see one is wearing a mask. Then I see a fire extinguisher in his hands. I start moving to the switch that controls the electric locks but, sadly, I reached it half a second too late. Two kids hold the doors open and this little jerk unloads an entire fire extinguisher into the store. Can't see anything, the entire store is filled with powdery haze. It took eight hours to clean up. Eight hours closed for a 24-hour gas station. And it turns out, the whole point was to steal an 18 pack of freaking Keystone. Kids, man. We had them on camera, but the managers decided it wasn't worth pursuing, I guess. Nothing came of it. None of them could have been over 17. They had two guys holding the doors open the whole time, so their friend who came in earlier (and I hadn't been paying attention to) could run out with the beer. The mag locks didn't matter since they had the door open first and kept it that way. It isn't that they don't pay me enough to clean, they don't pay me enough to deal with some little idiots who can plan something as elaborate as that and then take the crappiest beer in the store." "I was 20 and I had been working at Domino's for a few years running shift (managing). It was a great job while I was in school because they were flexible with my schedule. 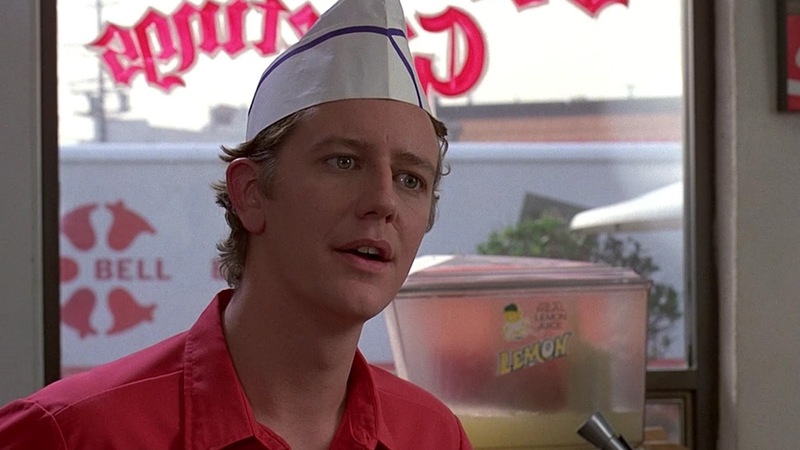 One summer night, it was very slow and three young teens walked in and asked if we sold pizza by the slice. We didn't. One of the kids asked if he could use the bathroom. I obliged because the only other bathroom around was at a gas station next door and it was really bad. I led him through the back and patiently waited and escorted him back up front. A few minutes after they left, I went back to use the bathroom. When I flipped on the light, I saw that the little jerk had pissed all over; on the seat, the floor, the walls, and on the lockers. I ran outside to see if I could see which way they were headed as I was about to call the police. Much to my chagrin, I saw them across the street at another pizza place that sold slices. I locked the door and sprinted across the street. They didn't see me coming, but I could see them laughing. FORGET THAT!! I didn't get paid enough to clean up some kid's piss. I barged through the door and grabbed the little jerk by the neck and dragged him, kicking and screaming back to my store. His two friends did nothing. They were in shock and probably thought they would never see him again. I took the kid back to the bathroom and gave him a buck of cleanser. I made him clean up the piss with his own socks and wipe every inch of the bathroom down with bleach. He cried the whole time." "I Was Yelled At For Not Muffling My Screams Better"
"In 2012, I worked as a busboy at a NYC restaurant during summer between college sessions. There was a two day period of extreme heat and heavy rainfall that filled the sewers and it all started coming up the drains in the middle of the basement floors (the basement was for all the food prep, freezers, liquor and keg storage, etc). Within an hour, the gray-brown water had risen to our knees and there were HUNDREDS of roaches swimming around trying to cling on to anything for dear life (mostly our legs). It was freaking horrifying and I nearly quit on the spot, but sucked it up. The restaurant stayed open the whole time and I was yelled at for not muffling my screams better." "Standing in a freezer, scooping ice cream into hundreds of martini glasses (the banquets were usually around 500-900) with nothing but a couple pairs of flimsy disposable gloves to protect my hands from the cold. Only to have the pastry chef say the balls weren't round enough and to do it all again. I was pisssd." "You Want A Sandwich, You Pay For A Sandwich!" Of course, that's about $2 compared to $6 or $7 for a sandwich. We argued for a moment, loudly enough for all the other people in line, and my teammate to hear. I glanced at my teammate, who had been there longer than me, for help and they gave the tiniest of head shakes. So I looked right at the customer and said, 'You want a sandwich, you pay for a sandwich!' and threw the nice neatly wrapped sandwich in the trash can behind me, and shouted, 'Next!'" "...He Didn't Have The Greatest Aim"
"Happened about two weeks into my job working at a college bar. Was on my hands and knees beneath a urinal, cleaning up the puke that had overflown and fallen to the ground. Surprisingly, it wasn't until another drunken idiot stood over me and began to piss into the urinal I was cleaning under that I had my, 'I don't get paid enough for this crap,' moment. ...He didn't have the greatest aim." "About 10 years ago, I spent a summer moving from temp job to temp job while on summer break from Uni. One of the jobs was in a cereal factory where they made cornflakes for supermarket owned brands. When I arrived after being sent by the job agency, they struggled to find me anything to do, but as the factory was on a 'cleaning day,' I was given a screwdriver and a hammer and told to hack away at the cereal build up in a big pipe that I could only get to through a 10cm x 10cm access flap. It was hot as heck in there because all the extractors were turned off due to the cleaning. To top it off, there was a leaky water pipe above me that periodically dripped searing hot water onto my shoulder. I still have a scar from where it burnt me. Anyway, after about an hour, I'd had enough and decided that being paid minimum wage, minus the agency's cut, wasn't worth it. Literally walked straight out, got in the car and bailed without saying a word to anyone." "I manage a supermarket. I was working one night and a customer comes running in, saying that there was a brawl outside. I pulled out my phone and rang the police as I walked outside to assess the situation. I see half a dozen locals throwing punches. I start to tell the police what's happening while keeping a safe distance. Then one of the brawlers pulled out a bow and arrow. My thoughts: Forget this noise, I'm out." "Witnessed someone's literal 'I don't get paid enough for this crap' story. I was at a ShowBiz (similar to Chuck E. Cheese) for a relative's birthday. All the kids were running about having fun, playing games, etc. Suddenly there was a commotion around the ball pit. Turns out some kid had a serious case of diarrhea, like a Hershey-squirt blowout, and it was all over in the ball pit. The little plastic balls were all covered with a thin film of booty butter. I'm across the room from the code brown near the counter where you trade in tickets for fake moustaches and Laffy Taffy. The manager told this teenager he needed to get to the ball pit right away, and was trying to hand him a mop. Not sure what a mop would do in this situation, but I digress. Anywho, the teen was not having it and loudly said, 'Nah bro, that ain't me,' and strolled out the door and into the sunset." "I work late nights at a pizza shop. I had a customer call up and tell me that they wouldn't be coming to pick up the pizza they had ordered because they always get sick after eating it (bull, but whatever - we have never had a genuine food poisoning complaint). I just said that's fine, have a good night. Then he started yelling at me and in the end threatened to assault me. Because he didn't feel like picking up his pizza? I don't even know. I was pretty shook up at the time." "When I argued with a table until they walked out because I didn't serve them first before another table. I had no idea how long they'd been waiting because our hostess didn't know how to do her job and sat me before I was even clocked in. This table literally lost their mind because I went to the other table before them because they were closer to me at the time. I'm not one to be rude and argue with customers, but I did not deserve any of the crap they said to me, so I stood up for myself, and they walked out." "I Just Subjected Myself To A Serious Health Hazard for $7.50 An Hour"
"I worked at a well-known chain ice cream place. Minimum wage. The drains that consume all of the dairy and fruit from the ice cream scoopers had been clogged for a WEEK before my manager decided to do something about it. There was gray, smelly water all over the floor behind the counter. She called the plumber, who showed up like four hours late to fix this drain. Well, let me tell you, friends, when he opened up that grate and scraped off the first layer of muck, it was like Hades itself had opened up from this drain and had viciously lashed about searching for souls to claim. The plumber immediately sat up, trotted out to the front of our building and vomited profusely for a few minutes while my coworker and I ran to the back room. We called the manager and asked if we could go ahead and close the store for the night so that no unsuspecting customers had to be subjected to this foul decay as they walked in. She refused and also told us it couldn't be that bad and that we needed to stay and serve. We were also not allowed to leave the store to buy medical masks across the street. I sat there. Constantly nauseous. Waiting for time to pass. FOUR FREAKING HOURS pass and we could finally close down. We got another call, informing us that we are to stay another two hours until the manager could get to our store to ensure the plumber did not harm any store property. I left that night with the knowledge that I just subjected myself to a serious health hazard, without safety equipment, for $7.50/hr." "My first job at a popular fish fast-food joint, I was idealistic, wanting to do well and eager to prove myself as a hard worker (mostly to myself, that part is kind of important). I basically dropped stuff into huge vats of oil all day long, removed with tongs, placed in warming area, repeat (repeat, repeat, eat little fried bits, repeat, repeat, more fried bits, repeat...) Closings regularly took us into the wee morning hours (~2 am) due to the fact that the entire floor and surfaces get coated in sooooo much oil all day long and required major scrubbing/cleaning daily. Three weeks into this and I'm getting sick of 2 am closings, I decided it wasn't for me, especially since those late nights weren't good for me as a sophomore in high school. I found another job at a toy store in the mall, same pay, no late nights. So, I put in my two weeks notice. So, it's one of my last nights on shift. A gentleman comes up to the pay area and notifies the lady at the register that the men's toilet is backed up. This place was staffed mostly by women for some reason, and this fateful night was no different. Thus it fell to me to address the issue. So, I head into the bathroom and assess the situation. We have a toilet completely befouled and un-flushable due to a First-Encounters style mound of crap just chillin' over the hole, soaking in the crap-water from someone else's attempt to flush it down. Seriously though, the construction of this turd-monolith HAD to be a group effort, it was insane. Another flush would likely dump foulness all over the stall/bathroom. I don't need to describe the smell of agitated soft poo-mound, do I? Totally gross, but I sucked it up. I mean, this is what happens when one has a job, right? So, I go to grab the plunger ... can't find the plunger. Head out and ask the ladies if they have a plunger or know where I can find one. The look they gave me should have told me to run. One of them headed to the back to grab something. When she came back, she handed me, with a straight face, some of those industrial strength looking yellow rubber gloves. No words were exchanged, this was simply my fight or flight moment. The conclusion is that my misguided, idealistic sense of responsibility prevailed over common sense and the toilet was unclogged. I will spare you the more visceral details. Crappy situation, eh? Though I guess I emerged a somewhat wiser person and I keep that little moment tucked away whenever I think of the value of a dollar or ever get frustrated at my job." "I LITERALLY Did Not Get Paid Enough For That Crap"
"I worked at a deli near my house. Got paid 6.50 per hour because it was owned by a church, non-profit. Not too busy of a place, in a not so busy town. Except for when said town throws its annual festival. It's the busiest weekend of the year for nearly every business on every street. Me and three other people are working frantically to keep this little sandwich machine pumping all while the place is slammed to the hilt with people... God, the people. Just so many jerks wanting so many different things: food, bathroom, directions, etc. In the midst of the chaos, somebody drops their basket of chips on the floor. So naturally, I go to grab the vacuum from the maintenance closet. I make my way through the crowd toward the back of the deli, which is where the closet and bathroom are located. The line for the bathroom stretched all the way to the front door. Bummer, I guess, but I really didn't care. I open the closet, turn on the light, and take a good a hard look at the vacuum cleaner in front of me. Apparently, some drunk jerk couldn't wait in line, saw the maintenance closet and, thinking it was another bathroom, went in. They probably soon noticed it wasn't a bathroom, but decided it was too late, dropped trow, and just left the creamiest, most explosive, crap splattered diarrhea I've ever seen all over the vacuum cleaner I needed so desperately. I immediately went home and just chilled, cause I literally did not get paid enough for that crap." "There was this really short, really obese woman (think flesh colored oversized beach ball) who would come into the local grocery store that I worked at when I was in high school and she always smelled just awful... Like sewage mixed with garbage and drowned in expired milk. You couldn't go within 25 feet of her without gagging. I still feel kind of bad for her to this day, honestly. Anyway, she comes in the store one day, grabs her cart to lean on, as usual, and starts shuffling to the other side of the store. About 15 minutes has gone by and I'm realizing that I can still smell her repulsive scent almost every aisle I walk down, even after I just saw her 15 seconds ago and walked away in the opposite direction. I wasn't the only one either, the cashiers and the manager could all smell her almost constantly, but none of us could figure it out, until she approached the register to cash out. Turns out, this lady had the worst case of diarrhea I have ever seen or heard of to this day. I guess she thought her multitude of poops were only farts and she just pooped all down her pants and out her shoes and left a trail all along the store, complete with her shoe prints, which tracked in spots where the leakage was minimal. My (usually cool) boss tried for a half hour to get me to clean it up, threatened to have me fired, and have my hours cut, etc... I told her go ahead. I'd rather get fired from a minimum wage job than clean some lady's gross poop trail. She caved eventually and cleaned it herself." "Oh Geez, Did Someone Have A Dog In Here?!" "I used to work at the local Dunk n' Donuts, one of the busiest in my area. It was Valentine's Day, which made the day a little extra busy/hectic. While working the register I got a whiff of what smelled like a vomit inducing fart. I thought it came from my manager, who was standing next to me. Five or so minutes go by, and we heard an elderly lady yell, 'Oh geez, did someone have a dog in here?!' in a very frightened voice. I walked over to investigate what in the world this woman was talking about and found a nice, fresh pile of elephant sized poop in FRONT of the bathroom. My manager looked at me and went, 'Grab the mop.' While trying to keep in my vomit, I mopped up this liquidly poop pile leading into the bathroom. Some old fart walked out of the bathroom with poop all over himself and went, 'Sorry for the mess, sonny!' and handed me a $5 bill. The inside of the bathroom looked like a murder scene, only if you substituted blood for diarrhea. I definitely did not get paid enough for that crap. Guess you could say I had a pretty crappy Valentine's Day, too."